Another round of Yoga for Low-Income Residents begins on April 30th! United We Om will be providing Yoga and Meditation practice to women in residence in the low income housing being supported by Westhab. These are women with enormous stress in their lives - in many cases single motherhood, poverty, and an uncertain future. 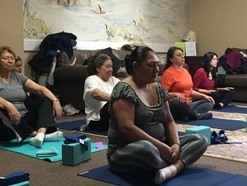 Our mission is to provide them with tools they can use in their daily lives such as simple asana, meditation, and breathing techniques. We are providing mats, blocks and straps for the Karma Project so that the students can have the most supportive and nourishing experience possible. Westhab is the largest nonprofit provider of affordable housing and supportive services in Westchester County, NY. We are designated as a 501(c)3, and since 1981, we have helped more than 5,000 homeless families and individuals move into their own apartments. We have developed nearly 700 units of quality, affordable housing representing a public and private investment of more than $60 million. Each year more than 1,200 homeless or at-risk youth participate in our youth programs, hundreds of families in underserved neighborhoods get help in our community centers, 250 people find new jobs through our employment programs and 850 households call our properties home. Learn more about Westhab. 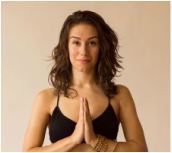 Christina Lancione, RYT-200, initially sought out yoga purely for the physical benefits, like many others. With a background in gymnastics and competitive cheerleading, she gradually ceased to see yoga as a sport that has to be completed or performed, and instead found herself enlivened and inspired by the multi-faceted life journey that it truly is. She realized that how you do yoga is how you do life. Christina believes the greatest gift you can give another is the space to be his/her true self. For this reason, she particularly likes teaching beginners and conveying the fact that there is no goal, image, or standard they have to live up to in her class. Her classes are focused on alignment, concentration, and most importantly, breathing and relaxation. While fancy poses are fun (and quite addicting! ), she reminds her students and herself that true mastery is over the mind. She sees each student as a unique soul playing their own exclusive role in the cosmic drama that is life.